Ever since joining WarmShowers, we have been on the receiving end of innumerable heart warming personal experiences. The organization exists to facilitate long distance cyclists who host other traveling cyclists. So when others welcomed us into their homes throughout our previous cycling tours, we were overwhelmed by their extraordinary hospitality and the friendships that ensued. But opening up our home to cyclists has proven to be equally rewarding. When that hosting request comes in we never know the full story of those cycling through Duluth. Reading their profiles gives us a little background. But it isn’t until they arrive and the cyclists’ stories unfold that we truly begin to understand the personal stories behind our guests. And it’s not always about the cycling. This weekend we had the privilege of hosting Derek. We knew from his website that he had terminal cancer and that in the face of that news he chose to fulfill a life-long dream of cycling around the world. But that didn’t begin to prepare us for the enriching experience of sharing four days with Derek. Despite a house already bulging with kids and noisy grandkids who came for Grandma’s Marathon, Derek slipped right in and joined the festivities. 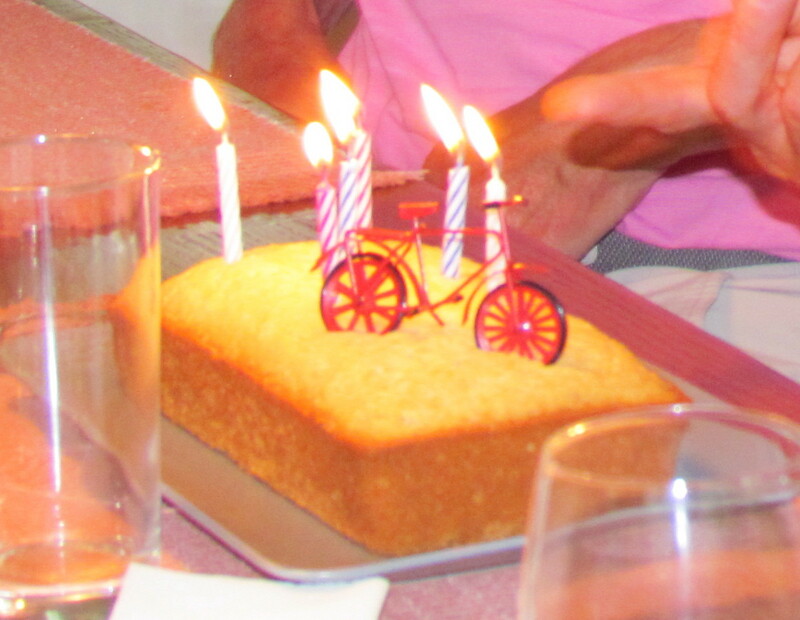 When we learned that it was also his birthday, we couldn’t resist the opportunity to celebrate the occasion with a bicycle-topped cake. But it was in the quieter moments that we gradually got to know Derek. The doctors had given him 12 months to live, but Derek has already spent 19 months on his world cycling tour. As it turns out, this is only his most recent bout with cancer, having faced it at least twice before and losing his wife to breast cancer. Despite having traveled 4 continents and 44 countries to date, including some hair raising experiences in Asia, he admitted to slowing down, knowing he can’t do as much as he could when he started and needing more rest days. Given that knowledge along with enjoying his company, we heartily encouraged him to prolong his stay with us. Derek’s purpose in his trip is to inspire others. In the face of devastating news, he didn’t accept defeat and wait for the cancer to overtake him. He plans to fight it right to the end. To help spread the word, Fox 21 News came out to interview Derek, featuring his story on the evening news and on their website. It didn’t take a newscast to convince us, however. In his quiet way, Derek exuded a confidence and determination that was impossible to ignore. 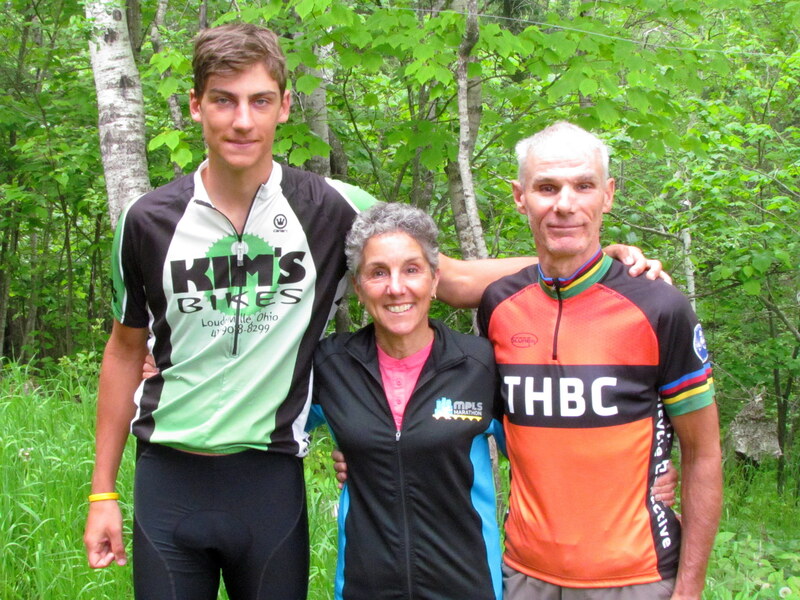 Since the two cyclists were traveling in opposite directions, it was the perfect opportunity to trade notes on the routes they covered to reach Duluth. And we enjoyed eavesdropping when they shared anecdotes about stealth camping, eating on the cheap and other aspects of seasoned cycle touring. It was easy to slip into the camaraderie of long distance cyclists, sharing a passion. The house seems strangely quiet now, with our guests cycling on to their next destination. But we are richer for getting to know them. We thought hosting other cyclists was providing a service. Instead, we have been truly blessed by those passing through our lives on two wheels. 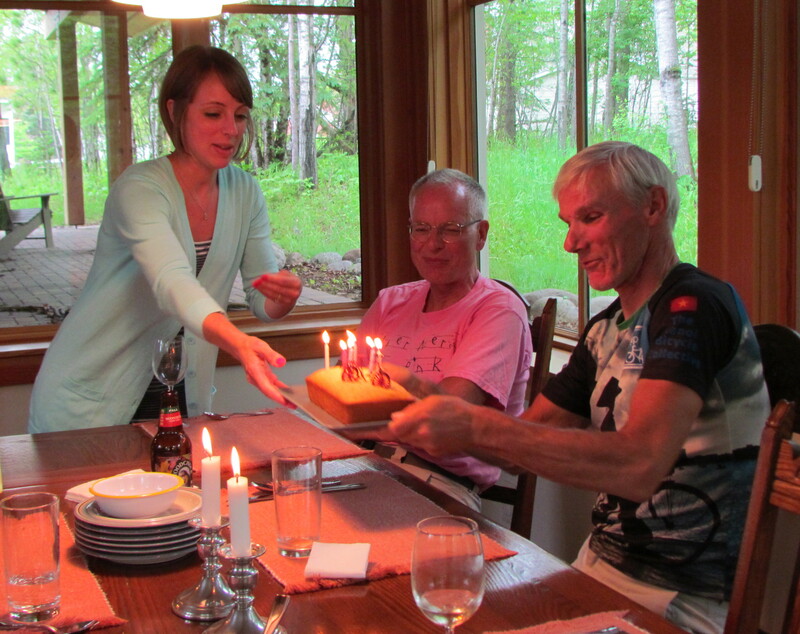 This entry was posted in Travel and tagged Cycling, Friendship, Travel by Molly. Bookmark the permalink. Happy to hear you’re doing well Derek!